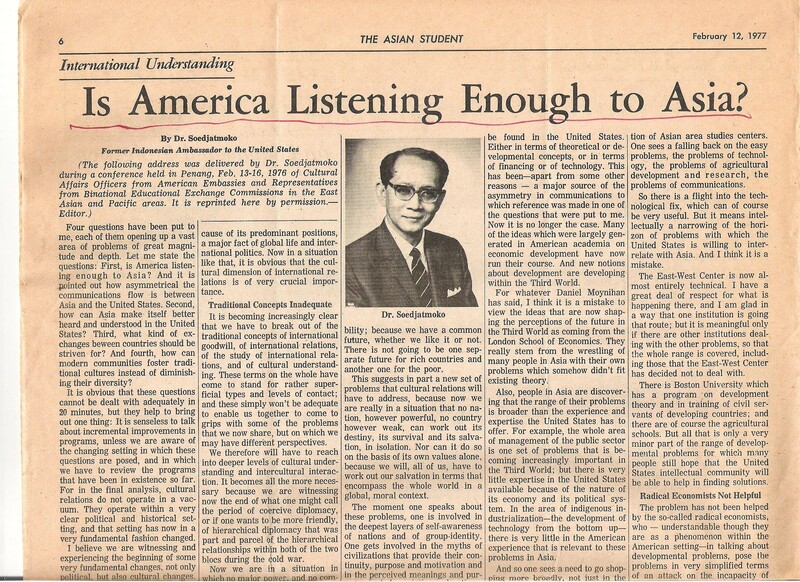 The article in The Asian Student that Moineddin sent to Mansur was titled “Is America Listening Enough to Asia?”, originally delivered to a conference in Penang in 1976 to Cultural Affairs Officers from the American Embassies and Representatives from Binational Educational Exchange Commissions in the East Asian and Pacific Areas. It was authored by Dr. Soedjatmoko, the former Indonesian Ambassador to the United States. It was 8 columns in an 11 inch by 17 inch paper, a long, boring article, without any marks by the reader that it had been read by this person in 1977, and when reexamined from beginning to end at present, it was at best a lengthy answer of “No” to the title’s rhetorical question. Enclosed is an article from The Asian Student which I feel was authored by a real Sufi. His comprehensive view of the real world reminds me very much of Murshid’s all-encompassing view. It is really the best paper on international affairs I have read since Murshid’s Peace Plan for the Middle East. I just finished a poem remembering Murshid’s walking with us up Bernal Hill. I’ll send it into Bismillah and, inshallah, they’ll publish it in the next issue. You’ll see it then no dubt. No need for you to acknowledge this.